The Attack Democrat--Nothing Conservative Here: Republican mandate? What mandate? You’ve probably heard a lot about the message voters supposedly sent to Washington from the mid-term elections. The Republicans say they have a clear mandate to cut taxes, decrease the size of government, cut spending, repeal health reform, repeal financial reform, etc., etc., etc. Well, that’s not at all what the voters said. Pew Research has released results of exit polls that sought to determine why the voters were voting the way they were. Result—Voters are just about evenly divided on most issues. For example, 39% say Congress should focus on reducing the deficit while 37% say No Congress should spend to create jobs. 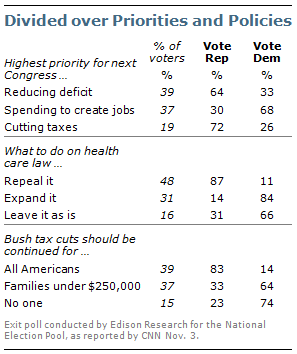 48% want Congress to repeal the health care law while 47% say expand it or leave it as it is. 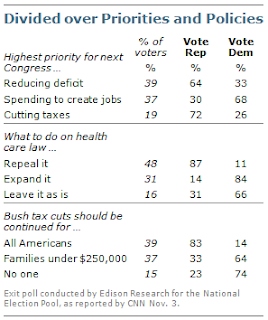 39% want the Bush tax cuts extended for all Americans including the rich while 37% want the tax cuts extended just for families under $250,000 and 19% don’t want them extended at all. So much for a Republican/Tea Party mandate. It just doesn’t exist. Never did.